Many parents are unsure of when to schedule that first appointment, some choosing to once they notice any problems, others waiting for your child’s first teeth to come in. The Academy of Pediatric Dentistry says its best to schedule their first appointment no later than when they turn one, or when their first tooth starts to come through the gums. 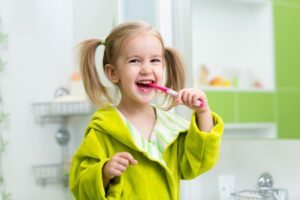 The first visit is more to establish a familiar oral hygiene routine for your child and make sure they become comfortable with the dentist and all of the cleaning tools. This can reduce the chance that they develop dental anxiety later on in life and will allow them to have a positive interaction to base their future visits on. During this visit, the dentist will have a quick look in your child’s mouth and try to scope out any sign of decay. They’ll check the gums, jaw and bite and talk to you about ways that you can improve and maintain your child’s oral hygiene. This is also a good time for you, as a parent, to ask any questions you may have about how your child’s mouth will develop. How Do I Prepare My Child For Their First Appointment? Try not to keep the visit a surprise. When you prepare them, you don’t want to cause them to worry about their upcoming visit. Discuss the dentist in a positive way and try not to set any expectations for your child. Try to avoid words that are associated with physical pain like “hurt” and “poke.” Instead, tell them the dentist is going to count their teeth and enjoy their smile. If your child is very scared or worried, it may be a good idea to hold a pretend visit at home. You could simply count their teeth and hold a mirror up so they can see them. It’s fairly typical for a child to get fussy during a dentist visit. For this reason, it’s best to schedule it closer to the morning or afternoon when they’ve just woken up and are well-rested. Lastly, it’s a good idea to avoid any kind of material incentive for going to the dentist. This only serves to make your child skeptical about what to expect and sends mixed messages if you bribe them with candy when your dentist has just emphasized oral hygiene. What Good Dental Habits Are Important For My Child To Establish? You may also wonder when your child should start brushing their teeth and how to prevent them from getting cavities. As a parent, it’s important for you to make sure your son or daughter has all the tools they need to maintain their oral health when they get older. Good dental hygiene should begin before your child’s first tooth comes in. These teeth, while not visible, start to form in the second trimester of pregnancy. Before they come in, you can run a sterile damp washcloth over the gums to help prevent bacteria buildup. Once they arrive you can brush them with an infant toothbrush and a tiny dab of fluoride toothpaste approved by the ADA. When your baby’s teeth start to come together, you can begin to floss as well. Once your child gets older and they become more susceptible to getting cavities, be sure to limit or steer them away from sugary foods like candy and juices. These kinds of food can erode enamel. When they do eat these types of snacks, it’s a good idea to have them rinse their mouth and brush their teeth afterwards. As your children get older, it’s important to form a routine of regularly-scheduled dental checkups and cleanings for them. Working with your children’s dentist can give your child a good understanding of why it’s so important that they maintain good oral health. Dr. Philip Batson provides an extensive amount of services for his hometown. Whether you’re looking for a family dentist or to have cosmetic work done, he gives his beloved community of Columbia the personal interaction and attention that they deserve. Dentistry is not only a career for him– it’s a family tradition! For questions or to schedule an appointment, visit his website or call Healthy Smiles at (573) 875-7071.